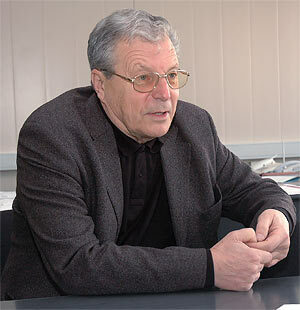 On March 5 Academician Sergey Viktorovich Gaponov, a recognized authority in the fields of laser physics, x-ray optics, interaction of radiation and matter, superconductivity, physics of solid-state nanostructures, founder and first Director (1993 — 2009) of the Institute for Physics of Microstructures of the Russian Academy of Science, laureate of the USSR State Prize, awardee of the Order of Friendship, turned 75. Editorial Board of the «Nizhegorodskii Potenzial' Journal joins in the numerous birthday greetings and congratulations to Sergey Viktorovich and offers the readers the interview he kindly gave to our journal. — Sergey Viktorovich, your early years fell on the wartime. Do you have any vivid memories of that period? — I remember, we were pretty hard up, especially at the beginning of the war. Anything that seemed of value was exchanged for potatoes. When the war broke out, my father shut down the GIFTI (Gorky Research Physical-Technical Institute) of which he was Director and went to work as a radio engineer at the aircraft plant, then referred to as factory No 21. He was involved in the development of radio communication devices for the aircraft manufactured there, the just-assembled planes took off the factory airfield and headed straight for the front. Dad came home only once a week, mother was working hard, too. The upper part of the city almost escaped bombing, it was the industrial areas that suffered most. But the glass in our windows shattered during those bombing raids. I was growing up in the street, among other kids, it was a normal childhood at the time. The only thing that distinguished me from my peers was that my parents were scientists, but all the same, there was nobody to keep an eye on me. I went to school No 8, the school backdoor led outside to the Mytny market, and we used to skip classes to run there. There were mostly handicapped people trading at the market, without an arm or a leg. We could buy a copybook, and an ink-pencil, and other stuff. And there was such a flavor about the place that once you’d been there, you’d never forget! But in my family I saw a different life, and that’s what was my main education. Father tried to raise us in a manly way, he used to say «save fondling stuff for cubs and calves'. He never kissed us, he’d sooner give us a cuff on the nape but never with a resentment or other negative feeling. I now head the Chair of Elelctronics at the university, that my father, Victor Ivanovich, was Head of in his time. People there keep warmest memories of him. — I guess, you were pampered in the family, as the youngest? There was nobody to pamper me — my parents were seldom seen at home, actually. Mother used to cook a pot of soup to last me and Andrey a week, and we would warm it up an eat on our own. I'd never seen a fork until after the war because all forks in the house had been removed as unnecessary. But mother always «placed” me for the summer with somebody. One or two summers I spent at S. S. Chetverikov’s, professor at the Gorky university and world famous geneticist, on his oak silkworm breeding farm in Shchelkovsky Khutor area. Another time it was with a mother’s employee’s family in the «Paris Commune' bay locality. That summer left an impression of being just sand and horseflies. And in my school years I was invariably sent to pioneer camps, and that’s it. — Have you always known you are going to be a physicist? — There was a time when I dreamed of becoming a writer. I used to read a lot. But I was self-critical enough to give up this idea. As for physics, that’s how it happened. Our physics teacher at school was Grigory Iosifovich Perelman. I liked his physics class and that he singled me out of all the students and was the only teacher to give me excellent grades. In all other subjects on the school science course my grades were always lowered. As a youth I was pretty impertinent and, when solving the problems in class I had the nerve to skip the derivation procedure and wrote the final expression at once. This, by the way, is why I had to quit school No 8. I have to admit that since early childhood I have never been able to obey or put up with any kind of authoritarian attitude. I refused to go to the kindergarten because kids were made to sleep with their legs stretched out and I preferred to have my legs bent. And at school, for example, starting from the 7th grade I used to have only one copybook for all subjects. When reprimanded on that account, I boldly replied that since it was the so-called «general-purpose\' copybook it could be used for all subjects. And I felt no shame, only before my mother whom I was very proud of. She was summoned to the school where she lived through very unpleasant moments because of me. The troubles escalated into a major conflict, and at the beginning of the 10th grade our headmistress told me I was not going to finish school. «Then let it be finished with without me', I replied and quit. I finished school No14 as an external student. After school I entered the Polytechnical institute. My parents worked at the university and I thought it improper to study there. — The website of the Institute for Physics of Microstructures RAS offers the reader your article, My story of the foundation of IPM RAS, in which you tell about your way in science, what underlay the construction of this remarkable temple of science, the IPM RAS. You end your story with the words: «Epochs change. What we have accumulated will work yet'. Do you mean this country needs a different science today? — As a matter of fact, I think that science is like the theatre. In both communities devoted people live by their work, give themselves wholly to it, live through various life situations. But there are repertoire actors and private theatrical enterprise actors. These are completely different people. A repertoire actor sacrifices his own conveniences for his home, the theatre, whereas an actor-entrepreneur leaves for where he has it better. And it is not necessarily the money that drives them. It may be for the pleasure of working with the best theatrical director or for the opportunity to get a strongly desired role. The same with scientists. My colleagues and I had set out to create a home, and those with the enterprising attitudes had left. Now the scientists who had gone abroad are being actively invited back, but on return such people remain entrepreneurs, and they are not going to advance our science. Building science based on the entrepreneurial principles does not seem to be the right way for Russia. In the USA it is quite common that a person graduates from college in one place, does a PhD course in another, and gets a job in still another. This is, of course, a useful practice in terms of mastering different approaches but, as Fazil Iskander put it in his story ”Sozvezdie Kozlotura (The Kozlotur Galaxy)”, «good animal, but it doesn’t fit in our climate”. It would be naïve to assume that with the support of so-called «kozloturs\' we will have our science organized as in the West. Scientific schools in Russia were being created by generations of people dedicated to science and bound to live in one place all their life largely because of the notorious housing problem, but it contributed to establishing a tradition of scientific schools. And the very idea of destroying everything and do it the new, alien way, is counterproductive. One should play with the cards one has on hand, for trying to play other people’s trumps is doomed to failure. Revival of science in Russia should be effected from its present level rather than by attempting to leap over the epoch. — And what can you say about the idea of convergence of sciences? — It is not a new idea, it has always existed. One example is the Nobel Prize for discovery of the DNA double helix. This work was started by a biologist, and when the need arose he engaged an expert in x-ray diffraction analysis. They were unable to understand the bonds between the DNA helix strands and thus a chemical scientist joined in the work. This kind of convergence has always been on the agenda, but sciences have never been taught all mixed in one university course. It would be the way to turn out a specialist that is specialist in no field. The best department in our university is the Chair of electrodynamics. Electrodynamics deals with very complicated but solvable problems, it is good for teaching. And when everything is mixed up and confusing, teaching is impossible, it is rather the challenges of the next stage, research. — Sergey Viktorovich, when was science better off, in the Soviet times or is it now? — As a matter of fact, neither then, nor now. In the Soviet Union we faced astounding things. For example, equipment, home-made of course, had to be ordered four or five years in advance, and it so happened that when you finally got your order, you were already doing something else and didn’t remember what it was all about. Planned economy. Of course, huge money was spent on the defense-oriented research but we paid for it by being closed to the world, which is annoying. Today everybody is into the breakthrough areas of research that are much talked about and covered by the media, but there are no breakthroughs to be seen. Because of the competition between the Soviet Union and the USA all branches of science were supported, just in case, which was particularly important for the fundamental science. 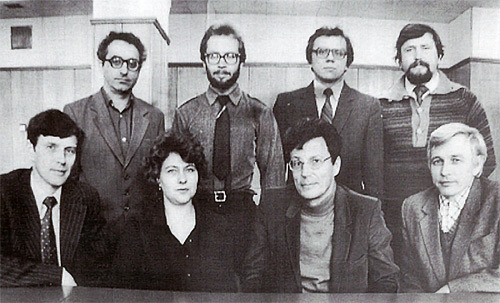 Leading scientists and staff members of the solid-state technology department with the Institute of Applied Physics, 1979. Left to right: Dmitry G. Paveliev, Valentina A. Tyurina, Sergey V. Gaponov, Nikolai N. Salashchenko. 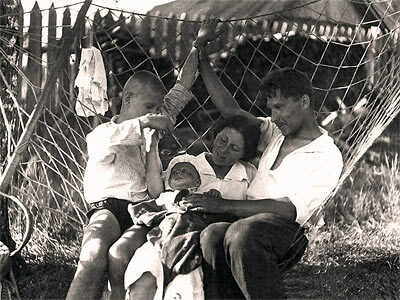 Standing (left to right): Valery M. Genkin, Igor G. Zabrodin, Yury Ya. Platonov, Eugeny B. Kluyenkov. At present all persons except for V. M. Genkin and Yu. Ya. Platonov who have left for the USA, work at the IPM RAS. — Has your life changed much after you resigned from the post of Director of IPM RAS? — A high-ranking position always suggests, on one hand, big opportunities for the person to realize his plans and goals and, on the other, a test of power. It does happen that people get carried away by the powers bestowed in them by their status, but it is not my case. When at the start of my professional activity I considered the carrier opportunities, I came to a conclusion that the best position would be that of a leading designer. This person is actually supervisor of a research topic and he is free from any administrative duties. Yet, it turned out later that in this capacity one finds it impossible to realize certain projects. So, I had to take on the responsibilities of head of laboratory and then head of department. And thus I advanced on the career ladder by pursuing certain goals that can’t have been reached within the scope of my current job competence. But I have never enjoyed power. Now I can give myself totally to science. — Sergey Viktorovich, what do you like to do at leisure? — Reading. I usually buy and read through two or three books a week. Now we can get hold of books by the authors that were not published or translated earlier, and it is very interesting. I used to love fishing. I had a motorboat and would spend a lot of time on the Volga. By the way, back then the river was teeming with the hydrofoils activity, «Raketas\' passed by every hour, and it helped me develop a good sense of time. - Is the sense of time important for man? — I don’t think so, it is rather an atavism, our feel of nature. Whatever it is, it helps me to never be late, which in a certain position is a form of being polite, you know. Seriously speaking, my attitude to time is more akin to Pushkin’s. As you can see from this interview, I did not live in the best of times. But Russia, on the other hand, has never seen ones. I think, one should neither succumb to time, nor try to put a halter on it, even though it helps some to succeed, apparently, for a while. We must do our work, carry out our mission, and try not to bury our talent. As taught by the Bible and Pushkin.